Which Rollerski model is the right one for me? We are trying to lighten things up a little for you concerning the rollerskis by Four Ace Europe, better known as Skike. If you have decided for a rollerski by Skike, you have already made one decision: You prefer a rollerski which you can manoeuvre with full control and confidence!! That’s what all Skike-models have in common. 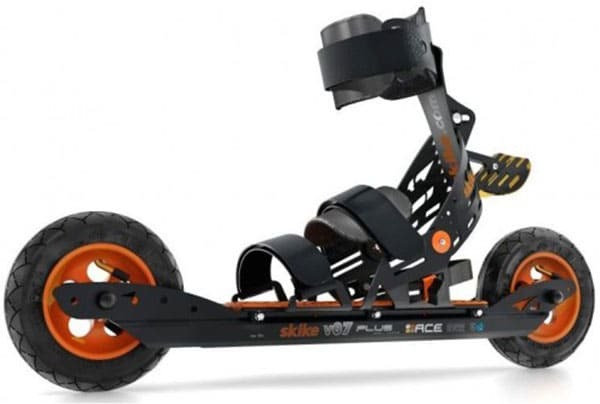 At the moment, there are five different rollerskis by Skike available: The Skike V07 Plus the Skike V07 Fix the Skike V08 Lift 2R the Skike V08 Speed and the newest addition to the family, the Skike V08 Tour. Let’s take a closer look on the respective rollerskis to see their differences. The Skike V07 plus is the oldest of the above mentioned skike rollerskis. Since it is very light, versatile and very inexpensive as well, it is often purchased by beginners. The features are very basic, nonetheless solid. When using the V07 Plus, the heel is attached to ski and not liftable. 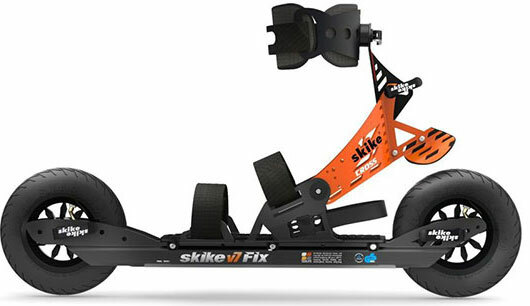 The successor of the Skike V07 Plus is the Skike V07 Fix. As the name already tells you, it also keeps the foot fixed to the ski. Unlike the V07 Plus, the V07 Fix is equipped with the quick release mechanism. This enables an easier and quicker change of tire than with regular screws. Also the handling of the velcro straps has become easier with this ski. They have thicker folded over & stitched endings which makes putting the skis on a lot easier. Other than that, the Skike V07 Fix has different bearings than his predecessor. So basically the Skike V07 Plus and the skike V07 Fix have a lot in common. The latter offers you some nice little gadgets that makes their handling more comfortable and user friendly! Furthermore the new & improved road star tires are more resistant wear & tear. A definite plus!! 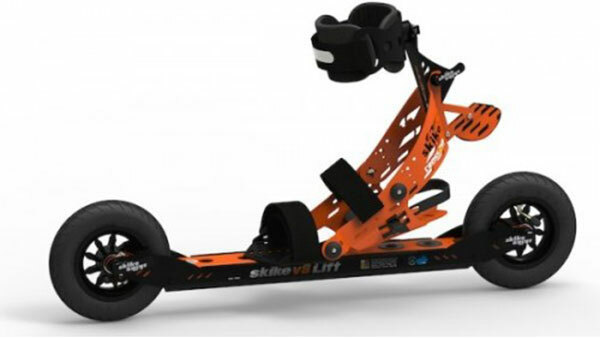 Let’s take a look at the Skikes of the V08 group now: Available here are the Skike V08 Lift Cross 2R the Skike V08 Lift Speed and the Skike V08 Tour. They have especially one thing in common: The heel plate is not fixed to the skate, but can be lifted. This enables you to rollerski with a skating technique with loosened heel or free heel which comes closer to the technique of cross country skiing. Of course there are also differences between these three skis, to make sure everyone’s preferences and needs are fulfilled. 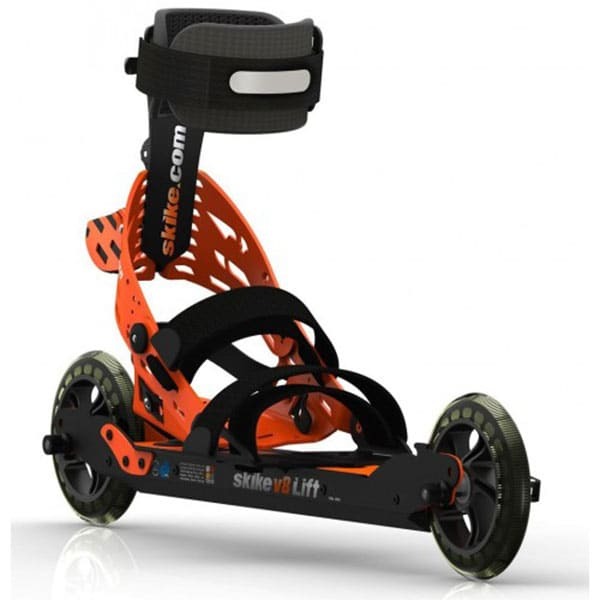 The main difference between the Skike V08 Lift Cross and the Skike V08 Lift Speed is their wheels: The V08 Lift Cross uses air tires while the V08 Lift Speed uses 125mm PU wheels, like rollerblades. The PU wheels provide a way larger speed, but are lacking the cross country abilities of pneumatic tires. You can only roll with it on even grounds such as newly paved streets. Strictly speaking, they can not be classified as off-road rollerskis. The Skike V08 Lift Cross is equipped with a standard reverse lock, while the Skike V08 Speed does not have one. It is not possible to add a reverse lock to the Skike V08 Speeds. 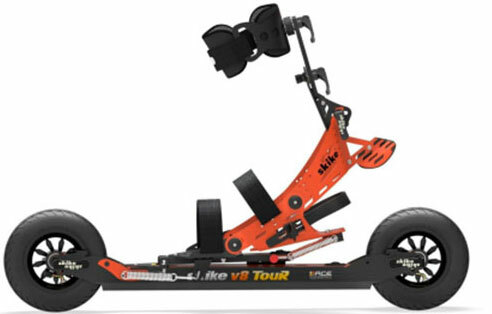 The newest Skike, the Skike V08 Tour is an attempt to combine both rollerski techniques. With a bolt, which fixates a joint attachment on the front part of the foot plate, it is possible to either release the whole foot including ball from the ski or to drive the ski with only a minimal released heel. Like that, it is possible to adapt the rollerski to the desired technique. A pull spring mechanism at the ball of the foot (which pulls the ski toward the foot up until 45° heel lift) switches from 45° on and pushes the back wheel onto the ground. That way, the ski stays in line like it is necessary to drive the classical Cross Country ski technique. This ski is equipped with standard reverse lock in the front wheels. The possibility of a quick change between styles is convenient when rollerskiing longer tours with different terrains. If you are still unsure which Skike is the one for you, we are happy to be there for you via phone or email! The first generation is the Skike One4All pole. 2 piece telescopic this pole is resistant to wear & tear. Smart adjustable/replaceable ferrules. Ergonomic and adjustable straps. Comes equipped with rubber stoppers permitting one to either rollerski on or off road. Perfect for those wanting the freedom to rollerski starting with the lower price. 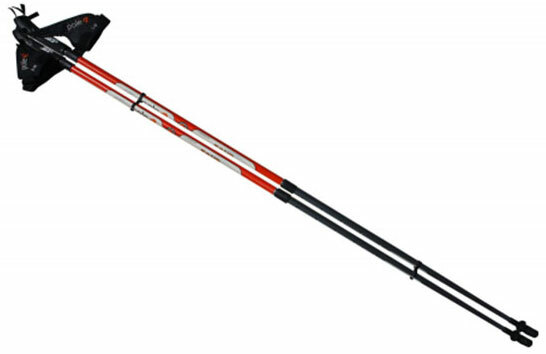 Skike traveler poles - Adjustable Super Rigid High Tech 100% Carbon Poles (145-170cm) - The 3-pcs. adjustable pole. Include carry-on bag. The 3-pcs. adjustable pole is the perfect traveler solution that fits into nearly every bag or suitcase. Fitted with multi function straps, professional tips and rubber pads for use on paved grounds makes this poles suitable for use in different terrains. Infinitely adjustable from 145-170 cm. It is these distinctions which make the adjustability of a pole so interesting and were the reason for its development. The fixing-mechanism, developed by skike, guarantees absolute tightness at each workload. Ideal for all equivalent winter sports.